Thailand is traditionally a Buddhist country and has preserved the ancient royal system. 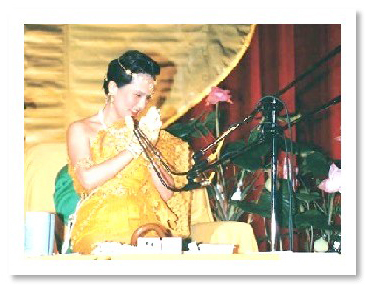 On the day of the lecture, Master appeared in the lecture hall elegantly dressed in a gold-colored, traditional Thai royal costume that stunned the audience. Her amazingly beautiful appearance not only was a great blessing for Thailand but also served to break the traditional Thai concept that spiritual practitioners must practice asceticism. After the lecture, many people asked our fellow initiates, "Why is a person who dresses so beautifully able to give such good teachings?" This was only one of the innumerable methods that Master uses to teach sentient beings how to break their habits and preconceptions. Her vast wisdom broke through the barriers of habitual thinking and preconceptions of the ordinary people. Undoubtedly such transcendence in concepts was a huge elevation and breakthrough for the Thai people. When the lecture and initiation ceremony ended, Master and our fellow initiates felt greatly relaxed. During a group meditation, Master happily told us that the world lecture tour was a success. We had sown many spiritual seeds around the world. After the group meditation, Master took us to the Chao Phraya River to enjoy the beautiful night view. We chatted and sang in contentment while soaking in Master's loving presence.